“Finding Paradise: Leilani Farm Sanctuary of Maui” chronicles Laurelee Blanchard’s unique journey from corporate America to nonprofit animal rescue. Her story is inspiring, devastating, instructive, heroic, and unforgettable. The story—enhanced by stunning photographs—begins by taking readers on a tour of Laurelee’s life running a sanctuary for rescued farm animals such as goats, pigs, and chickens in Hawaii. It quickly rewinds the clock beginning with her harrowing childhood, a highly successful career in commercial real estate, the joys and challenges of marriage, and her eventual decision to abandon her pursuit of money to start one of the most well-respected animal sanctuaries in the United States. You will be captivated by the accounts of her daring and life-threatening animal rescues. Her story will motivate you to think about everything you’re doing in your own life, inspiring you to pursue your own heartfelt passion and to cherish every day. Wow – I could not put this book down! Laurelee Blanchard’s heart shines warmly in this brilliantly-conceived book which tells her jaw-dropping and heart-wrenching life story, all of which led her to create Leilani Farm Sanctuary here on Maui. I’ve known Laurelee for several years and visited her enchanting animal sanctuary, but I had no idea until now what it took to manifest and maintain it. If you think this might be just a book with a lot of nice animal photos and stories about them like I did before I read it, it is far far more. It’s one of the best books I have ever read! Laurelee’s passions, her 100% selfless compassion, and her triumphs on her way to fulfilling her lifelong dream leave me, and I am sure it will leave its readers, forever inspired to do big and bold things to help our fellow creatures to live well and happily on this planet. Once I started reading this book, I couldn’t put it down. The vivid, colorful narrative makes the scenes and the author’s feelings come to life. What an inspiring story! Laurelee Blanchard is even more amazing than I realized during all those years when she volunteered her services for FARM and the animals. The three hundred animals at Leilani Farm Sanctuary are among the luckiest in the world. “In this extraordinary first-hand account, Laurelee Blanchard demonstrates her unwavering devotion to the care of rescued animals–and thus to the welfare of all sentient beings. What a shining example of love-in-action! By dedicating her life to the cause of animal protection and humane education, she has given animals a voice, affirming that each individual is a conscious “someone,” worthy of love and protection. Blanchard is a model of selfless service and Leilani Farm Sanctuary is indeed a Maui treasure! Have you ever opened a book, read the first chapter and found your eyes so full of tears that you had to blink them back to continue reading? Well, get set because you’ll find yourself immersed in the Leilani Farm Sanctuary surrounds described so vividly that you can visualize the creatures inhabiting eight acres of this wonderful garden of delights — writing so realistic that you almost feel as if you’re really there. You can “see” the sights, “hear” the sounds, and “smell” the fragrant tropical flowers. You’ll also be captivated by the author’s courage in disclosing some of the traumatic events of her life that led her to a hard-driving corporate career and then to giving it all up to being the very model of champion of all animals, large and small, those valued as “pets” as well as those viewed as “production units” destined for slaughter for humans to eat. You’ll be introduced to a large variety of lovable creatures from pigs, sheep, donkeys, deer, chickens, rabbits, cats, turkeys, ducks, geese, guinea pigs, tortoises, and even wild boars. From the first chapter to the last, you’ll be captivated by this amazing chronicle of an incredible life’s adventure. Laurelee’s book is a testament to what can be accomplished when we pursue our dreams with passion and courage. She takes us on a fascinating journey through her life, as she evolves from corporate businesswoman to animal activist and creator of Leilani Farm Sanctuary. Laurelee’s example of love in action shows how we can make the world a kinder, gentler place. Peter Mellen, Ph.D., author of Ultimate Happiness: Chasing it, Finding it, Living it. Leilani Farm Sanctuary is an extraordinary place run by an extraordinary woman. After leaving a thriving, successful career, Laurelee embarked on a journey to a more fulfilling and mission-driven life—one where passion and compassion rule. “Finding Paradise” is a wonderful, compelling story of losing it all but gaining so much. Jenny Brown, Co-Founder of Woodstock Farm Sanctuary and author of The Lucky Ones: My Passionate Fight for Farm Animals. Finding Paradise is a magnificent, thoroughly engaging book about Laurelee’s soul journey. This book is beautifully-written and a joy to read! Harold Bloomfield, M.D., author of How to Survive the Loss of a Love and TM: Discovering Inner Energy and Overcoming Stress. I’d expected that this beautiful book would be an amazing story, as well, about the history of Leilani Farm Sanctuary and about some of the individual rescued animals there. It did not disappoint. However, the first part, about founder Laurelee Blanchard’s childhood and younger adult years, was unexpected. Her childhood experiences made me ache for the helpless child that she had been, and for the even more helpless animals that she had loved, as they all suffered from cruelty that they should never have experienced. But it was, at the same time, for Laurelee, a beginning towards becoming the caring, capable and generous human being that I’ve been privileged to get to know through our mutual work with the Vegetarian Society of Hawaii, someone who used everything that she’d experienced in a positive way to inform and shape her future actions and goals, and eventually to create Leilani Farm Sanctuary, where animals who otherwise would have suffered shortened, unhappy lives as commodities, could enjoy a very different kind of life, cherished and freely spending their days interacting with other animals and humans according to their own personalities. In their turn, at Leilani, these animals constantly surprise and teach the humans who meet them some beautiful lessons about their fellow creatures on this planet of ours. Thank you, Laurelee, for this wonderful gift, both to animals and to the rest of us! Laurelee Blanchard’s Finding Paradise is an inspiring, deeply engaging story of one woman finding her life passion for saving animals and creating a sanctuary in Hawaii to make her dream a reality. Her hardships and struggles, her breakthroughs, and her compelling storytelling will keep you turning pages. Warning: this book may light a fire in you to change your own life and make a big difference in the world as Laurelee has! Laurelee Blanchard has done what millions dream of but few dare do. She left behind the American dream of unlimited consumption, and chose instead a deeper dream of limitless compassion. In the process, she found her soul, and she has become a beacon of hope and of love for us all. At one level, hers is a story of selfless service. But at a deeper level, it is actually a story of how we can all find ourselves, and our true fulfillment, when we choose to live our dreams. This story will inspire you. It will enthrall you. And it just might change your life. Finding Paradise is a life-changing book. It will inspire and educate everyone fortunate enough to read it. It is devastating, hopeful, surprising, informative, horrifying, hilarious, and fascinating. You will get to know Laurelee, develop tremendous admiration for her, wish you could be her friend, and visit her farm sanctuary. The stories of the animals she meets and rescues will capture and break your heart. You will cheer and cry. The ups and downs–my goodness! The photos are an incredible supplement to the story that make you feel like you’ve lived her incredible life with her. What a life! What a story! What a human being! This book is a gem–one of the best I’ve ever read. Weaving a rich tapestry of adventure and personal transformation, Finding Paradise provides a beautiful example of one person following her intuitive guidance to positively touch the lives of thousands of people and animals. Laurelee Blanchard, the founder of Leilani Farm Sanctuary of Maui, intrigues us with her remarkable odyssey, going from riches to rags, and on to real riches. She discovers the joy and fulfillment of living to relieve the suffering of abused animals, and inspires us with her determination and commitment to compassion. There is something for everyone in this fascinating, readable, and informative book. Most highly recommended! Will Tuttle, Ph.D., author of the international best-seller, The World Peace Diet, is a recipient of the Courage of Conscience Award, the co-founder of Circle of Compassion, and an acclaimed pianist and composer. 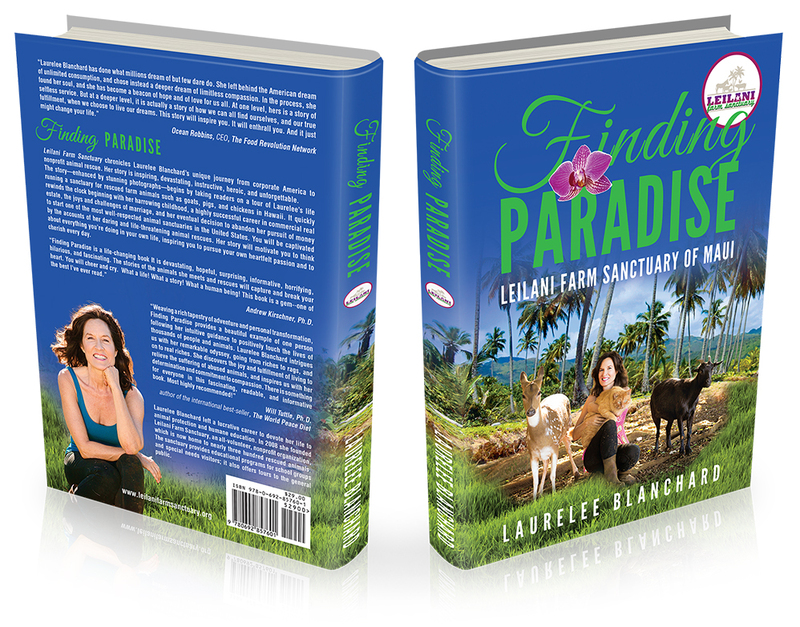 With “Finding Paradise,” Laurelee Blanchard has created a superbly readable account of a challenging life journey to success with what has to be the most gorgeous sanctuary for rescued animals on the planet. Read this book, savor the beautiful photographs, and you will likely feel the same gratitude I felt, that there are people like Blanchard, with the talent, energy and compassion to build a true paradise for animals and visitors alike.